Epiglottis gets its name from “epi” meaning “above” the glottis. Epiglottis is a flap of elastic cartilage which is present at the root of the tongue. During breathing, it stands open allowing the passage of air easily into the larynx, while during swallowing it covers the larynx like a flap and closes it thus the food is not allowed to pass into the respiratory passage and diverts it towards the esophagus. The epiglottis has taste buds on it as well. The epiglottis is formed from the fourth pharyngeal arch. The most common age group affected by the epiglottitis includes infants below one year of age and elderly over 85 years of age. The disease is caused by haemophilus influenza type b. The infection is now less prevalent due to haemophilus influenzae type b vaccination. Epiglottitis can be caused along with other infections caused by this organism. In the United States, the disease affects 1 in 100,000 adults per year and is not a common disease. It is usually the disease of adult men with a male to female ratio of 3:1. Worldwide, the disease is common in nations who do not get immunized by haemophilus influenza type b vaccination. The most common organism causing the disease is haemophilus influenza which accounts for approximately 25 % of the cases followed by haemophilus parainfluenza, streptococcus pneumonia, and group A streptococci. The disease is less commonly caused by staphylococcus aureus, mycobacteria, bacteroides, Escherichia coli and by candida in immunocompromised individuals. Although community acquired methicillin resistant staphylococcus aureus is an important cause of infections worldwide, still the organism does not cause epiglottitis. Non-infectious causes include crack cocaine smoking, thermal insults caused to infants who are bottle fed, ingestion of chemicals and chemotherapy to head and neck region. Lymphoproliferative disorders are also a possible cause. Diagnosis is made on direct visualization of the epiglottis by direct fibreoptic laryngoscopy in an operating room. In case of disease the epiglottis appears to be cherry red in color and swollen. Inspection by a tongue depressor is usually discouraged. On lateral spine X-ray, the disease is confirmed by a thumbprint sign which shows an enlarged and swollen epiglottis with dilated hypopharynx. On CT scan imaging, Halloween sign describes normal epiglottis but it excludes other causes of swelling in this region such as retropharyngeal abcess or peritonsillar abcess. 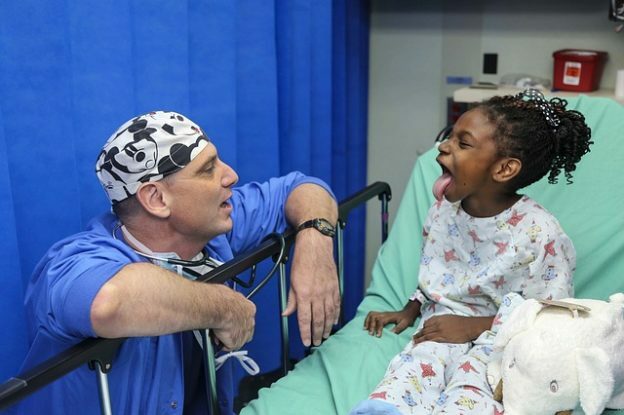 The prognosis with epiglottitis is good if it is diagnosed and treated immediately but the disease can be fatal and can lead to death if there is airway obstruction. The mortality rate among adults is approximately 7 %. If the patient presents with acute onset then first of all his airway should be maintained. Tracheal intubation should be done in case of airway compromise and if it fails then cricothyrotomy (surgical opening of airway) should be done. Second or third generation cephalosporins along with penicillin or ampicillin should be given for streptococcal coverage. Co-trimoxazole or clindamycin can be given to patients who are allergic to penicillins. Hib vaccine is not widely used for preventing the disease. In case of contact with an individual infected by H influenza, rifampicin can be used prophylactically. Westerhuis, B; Bietz, MG; Lindemann, J (August 2013). 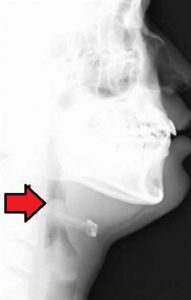 “Acute epiglottitis in adults: an under-recognized and life-threatening condition.”. South Dakota medicine : the journal of the South Dakota State Medical Association.